Benefitting handling with such a long zoom range is VR II image stabilization, which compensates for up to 3.5 stops of camera shake to help realize sharp imagery when shooting handheld. A Silent Wave Motor is also used to provide fast and precise autofocus performance, along with full-time manual focus override. All-in-one zoom spans wide-angle to telephoto focal lengths and is designed for Nikon F-mount DX-format cameras, where it provides a 27-450mm equivalent range. 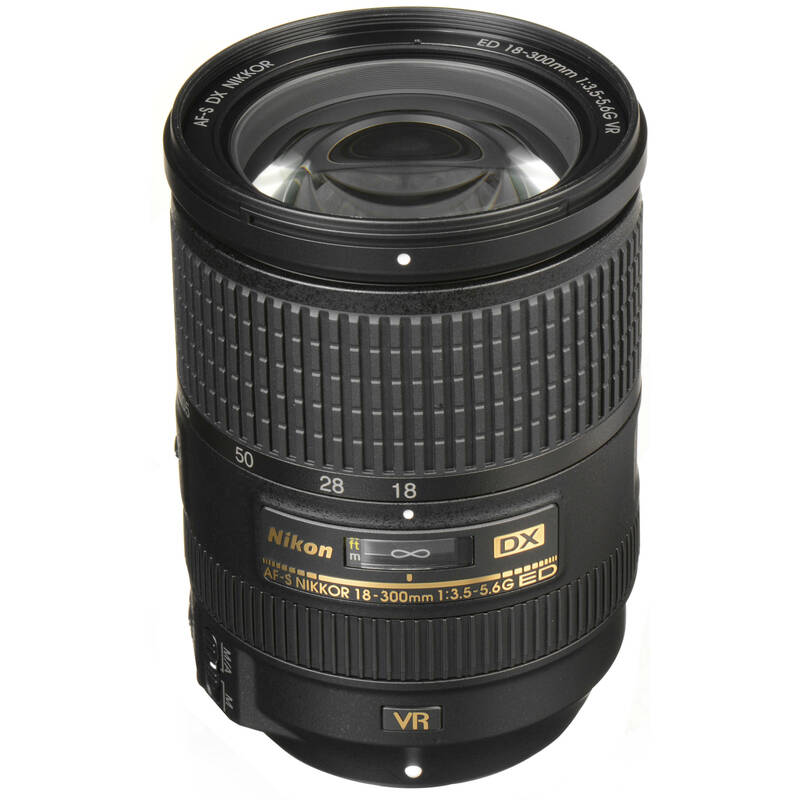 AF-S DX NIKKOR 18-300mm f/3.5-5.6G ED VR Lens is rated 4.8 out of 5 by 361. Rated 5 out of 5 by contramundus from Excellent all-in one lens! I am enthusiast photographer and this is my second all-in one lens. I'm impressed by the results. I bought the 18-300 VR (B&H) to replace my Nikon 18-200 VR (great also) looking for the additional 100mm at zoom. My body is a Nikon D7200 and I have to say that this lens works better than I expected. The construction with second generation of VR, the 9 rounded diaphragm blades, the three extra-low dispersion (ED) glass elements and the three aspherical lens elements, makes of this lens an ideal allied for a great range for shoots between wide angle and super telephoto getting amazing pictures. Don't worry about carry many lens. With this 18-300VR you will take all kind of pictures sitting on a chair! Rated 4 out of 5 by Divya from Mixed results, but overall happy I have a Nikon D5000, and a bunch of lenses, incl. 18-200 VRII that I have used the most and LOVED it. I realised that I was mostly using 18-55 and 18-200, but oft had to carry 70-300 lens for greater zoom. After much research, I sold 18-200 & 70-300 lenses and got this one 18-300. It is a tad heavier than 18-200, but great to carry around one less lens now. It is sharp- no surprise there- but it is not as sharp as 18-200 VRII. It's definitely softer at full zoom esp for night photography. But despite those negatives, overall, I am happy with it. Next, I want to get a 16-85mm :) Happy photography everyone! Rated 5 out of 5 by Bohonkie from AF-S Nikkor DX 18-300mm f/3.5-5.6G ED VR I have five Nikkor lenses and this one is the most useful. I am a former professional who now photographs as an intense hobby. I use this lens mostly for landscape (mountains, beaches, desert, etc.) and wildlife (stationary and moving under a multitude of lighting and temperature conditions). The bodies I most often choose are my D300 and my D5100. This lens does it all. I never have problems with the weight nor with holding the camera steady whether or not I use a tripod. Nikon seems to have fixed their past problem of lens creep (when focusing downward, the old lenses woul extend via gravity). This lens is extremely easy to use - I can think of no negative comments. Worth every penny. Rated 5 out of 5 by Chris from Better than carrying two lenses! I purchased this lens to replace my 18-200mm and my 70-300mm. I was a little worried it would not be as sharp with such a wide zoom range. So far I am very impressed with the photos, especially towards the 300mm end. It is a little larger and heavier than the 18-200mm but that is only noticable for a few minutes. It feels very balanced with my D7000 and a battery grip. I was a little surprised at how close I could focus, which makes it even more useful. I still use other lenses for macro, low light, etc, but if you want one lens to do just about everything, you will not go wrong with this. Rated 5 out of 5 by Kicker59 from I Like It! I really like this lens. It is heavy and on the large side but it feels good in my hands. The build quality is very good - Far superior to my old 18-105mm. The controls are well placed and easy to use. The zoom range makes life very easy. In the past I had two lenses to cover this range. It's a perfect travel lens. In many reviews I have read they talk about lens creep as of yet I have not experienced that. Maybe they have fixed that. The pictures are great. I just took it on vacation to the Caribbean and shot 400 frames. I am very happy with the performance. Rated 5 out of 5 by Windy City Guy from Excellent travel lens for the photo enthusiast Bought this lens hoping it would be a solution to the problem of inevitably not having the right lens on the camera at a given time while on vacation and missing some great shots as a result. Is this lens the answer? For me, yes, it is. This lens produces very high-quality photos for just about the whole focal range. I have not experienced any issue with lens creep that can sometimes rear its ugly head with zoom lenses. I have it paired with my D7000 and it's all I really need for any travel that I do. Makes packing for vacations much easier. Rated 4 out of 5 by John from Great all-around lens I bought this lens to replace my Nikon 18-200 VR that had begun to get quite a few miles on it. My body is a Nikon D5200. I shoot high school football as well as landscapes. I haven't had a chance to use it for the later much yet, but for football, it's been a great lens. Before this, I had been using a Tamron 70-300, but was limited when the action got too close to the sidelines. This lens lets me shoot wider for those times I need to. It auto focuses quicker than the Tamron and is also sharper. It's a bit on the heavy side, but I got used to that pretty quick. I'm going to be shooting high school hockey soon from the bench, so it'll be interesting to see how high up I'll have to increase the ISO. I can see this being my go-to lens for quite a while. Rated 5 out of 5 by Fritz from Good All-In-One Travel Lens This lens works well with my D7100. It is a bit heavier than the 18-200 mm that I have been using but the extra reach is worth it. I also have the 80-400 mm for more serious bird photography but that lens requires a much larger bag and I don't like to fly with it. This lens fits my Commando Pro 45 bag along with a super wide angle 10-24 mm and batteries and charger. The bag fits easily under most airline seats. Because of the extra weight one might want to consider a sling strap such as the Peak Design Slide sling/strap. Although this is not a pro lens it does the job for me. That lens is fully compatible with the D5000, including autofocus. D5300 compatible, and will auto focus work? I use this lens on a D7000 and absolutely love it. Nikon ED VR lenses should be fully compatible across the Nikon line of camera bodies that use them. The D5300 body is ED VR compatible. what is the difference with the other 18-300mm lens. the 5.6 is 1/3 stop faster than the 6.3 lens. the 5.6 has a 9 blade diaphragm and the 6.3 uses 7 blades. 9 blades will give you a little bit rounder opening when the diaphragm closes down to take a picture. how important that is i'm not sure since the picture is rectangular. both lenses have the same number of ED and aspherical elements so I doubt you would see any difference in the pictures. I love my 5.6 lens and would definitely buy either version. Does this len has the len creep issue as in the 18-200? 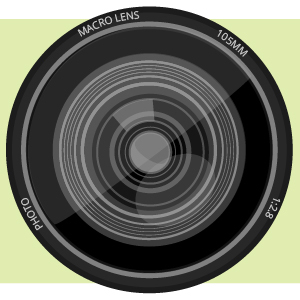 I have been using this lens exclusively on my Nikon D80. I have had no issues of any sort with this lens. According to the information we have, our current inventory's Country of Origin is China and Thailand. Please be aware this can change over the product's production life without notice. B&amp;H carries both a USA and an Imported version of the lens. The Imported version will come with a one-year warranty from B&amp;H, and will be listed as such on the lenss page. The USA lens would be distributed through Nikon USA, and would come with the Nikon USA 5-year warranty (1-Year International + 4-Year USA Extension). USA isnt listed on the lenss page, but that warranty would be listed in the Whats In the Box section on the lenss page. Yes, that lens is compatible with the D5300. Why is this so much more expensive than the other Nikon 18-300mm lens? Better glass is what makes it more expensive. I've had mine for quite a while and it is worth every cent.